That glaze is perfect! I've been looking all over for something like that. Thanks for the link! Laura, Diamond Glaze is another similar product. What a GREAT way to recycle those loose chips :) Adorable! I really like those!! I wish I had some lying around I could use! I LOVE these! I have no Pantone chips but have a lot of paint chips. I bet it could work the same way. What a good idea to use the glaze coating--gives it a very nice finished look. Thanks (as always) for the great ideas! oh I love these, they are adorable!!! These are so coool! Thanks Jess! Great idea!The colours are just great! These are great. It makes me want to make one on a wooden background, attach a hanging bail, and have myself a pantone chip necklace (a la scrabble tile pendants). LOVE these!!! You had me at 'Pantone'. Could you apple this product to a small photo and get the same result? Thks for sharing a great idea. Oh my gosh, I love these. So cute. I'm thinking you could change them with the season. Harvardmom, yep. I'd keep the photo quite small, since the larger the surface area, the more room for dimples and bubbles and whatnot. But sure, go for it! Jess this project is sooooo awesome. Thank you so much for the inspiration :). I have a question about the glaze, is this the same as CRYSTAL LACQUER? I too want to use it for paper so I want to make sure I get it right :). these are absolutely perfect! just love them. thanks for the tutorial! Awe, what a cool idea! Your tutorials are the best! ;) Thanks for sharing! you always amaze me with the things you create! love it! LOVE these!!! You never cease to amaze me - so creative and talented! Keep up the great work and thanks for continually inspiring us. What a wonderful idea! There is something so satisfying about a collection of little swatches of color, I have a huge stack of paint swatches I've collected from hardware stores just to look at them. I love these! Such sleek but bright little happy spots in your office! I love these what a wonderful splash of color! I love this idea. They are so cute and glossy. I'm wondering what else I could make using your technique . . . These are super adorable... I'm going to have to dig up my Pantone chips (I even have fabric Pantones somewhere). Wee! Thank you. What a great idea...I love the way the paper glaze gives it the shine...will have to try it out. Have had paper glaze blottle laying around for a long time now...will have to put it to use now. I am SO glad i held onto a whole book from spring cleaning a couple years ago! I would be willing to send a few to some people if they wanted to make some magnets. I have an out of date Pantone book that would be great for this project. Such a clever idea! How super easy and wonderful! I'd never thought of using these for magnets. this is all kinds of brilliant (and cute!). I love this. hahahahaha of course never test with orange pantone. that would be a crime ;). you are adorable jess. thanks for your kindness + answering my questions! Recycling is always a good thing! You know so well what makes an artist drool... super project! Have you ever used the paper glaze on photos? How about fabric? Or is there another product especially for fabric? I haven't used it on photos, but it works the same way on fabric—makes a clear, plasticky coating on it and doesn't seem to affect the color. Or maybe the color gets a little brighter, if anything. These are so creative! What a fun idea. I love the bright colors you used. Can you imagine actually having a wall painted in that bright of pink? ha, that would sure wake you up in the morning! I love the picture before the glaze dries just as much (if not more) than the finished photo. Yeah, apparently so. Everybody likes shiny, pretty colors, I guess! Someone on etsy is selling Pantone Pendants. I was seriously considering buying one. NOW I can make my own (thanks to you). I just have to find me an out of date Pantone book. I'm sure you could use this for photos, paint chips and walpaper! Thanks so much! I cannot wait to try it. Love them! I definitely need to head out to the raft store and pick up some of that Paper Glaze! And maybe a kayak, too. LOVE LOVE LOVE LOVE LOVE LOVE! OMG, I want to turn those in jewelry! Thanks for the great idea! Kristen from Apple Love- You said you have a book of chips and you would be willing to part with a few??? I would love to do this project and am hoping to track a few down. Would you mind emailing me brookeage(at)msn(dot)com. Thanks so much! These are so, SO cute! Gorgeous! Thanks for a great idea! What an awesome idea! The finished magnet looks so great. I love the colors — what a great way to make use of old paint chips! This is awesome! I am definitely going to have to do this. I like the idea. Look cools and cute too. Oh how cute! That paper glaze is so awesome! I am so going to create these for my creative director friend, Tina. She is going to LOVE LOVE LOve therm. Thank you for the wonderful idea. 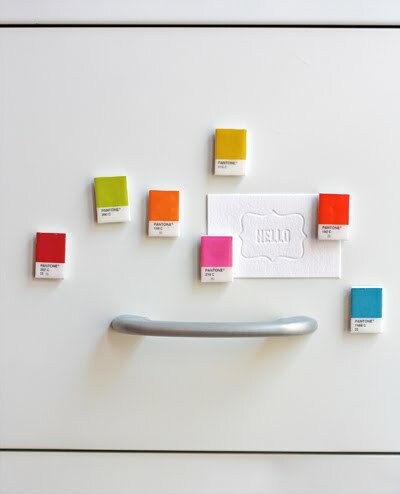 Such a nice idea, pantone olours on the fridge! This is the best idea I've ever seen! And now I'll go and find my paint chips. Thank you! 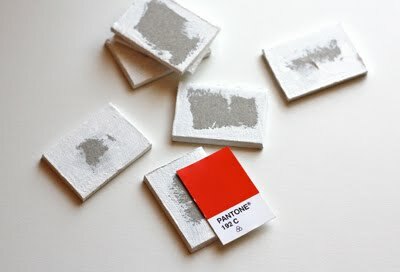 How does one get their hands on Pantone paint chips? Do you have to purchase them? Thanks! Yeah, the chip books are a couple hundred dollars, so unless someone is a design professional, they likely won't have one. You could check eBay, or else Pantone sells individual replacement pages, too. I have been obsessed with making these since I saw this post a few weeks ago! I couldn't find Aleene's Paper Glaze so I subbed with ArtDeco Triple Thick glaze. It was good; glossy like in the tutorial pics - but NOT GOOD for pinks and reds!! It washes them out to an orange colour! A great colour, of course, but what's the point in a Pantone magnet if it's not the right Pantone? lol I finally managed to track down the paper glaze and am excited to finish this project! These look really terrific! Perfect for an inspiration board. I'm in LOVE!! I have tons of these things from work and always wanted a creative way to use them. You're a genius!! I just made these - they are adorable. Mine took about 2 whole days to dry, but love the shiny look. I followed your instructions except used spray adhesive mount instead of double sided tape - but my corners are kind of coming up so the tape is probably better. I didn't have old chips but just designed some look-alikes using Pantones in Illustrator. Love the way they look in my office - thanks for the article! ooohlala! these are wonderful!! I'm so glad i found your excellent blog! hours of fun here! 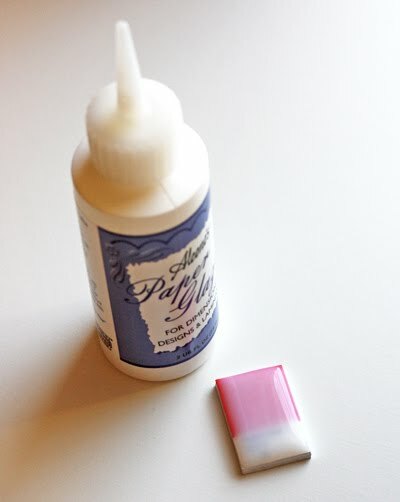 I linked to this post on my blog (A Blank Page) here: DIY Shiny Magnets :) Thank you for the inspiration! 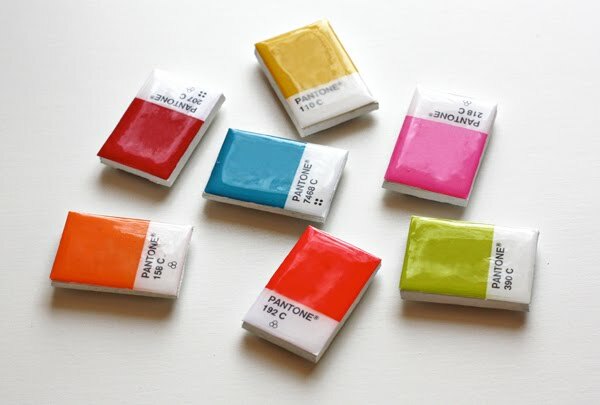 How can you get pantone chips?! I would LOVE to make these! Thanks! taylor(dot)montgomery3(at)gmail(dot)com. Thanks you all!! @Kristin, does the offer for some Pantone chips still stand? I would love to make a few of these magnets! :o) @Jess, i know there are a lot of replacement pages you can get from Pantone- are there any that you recommend? Great project!! Thank you! I never heard of this type of paper glaze and your projects are awesome! These are amazing! My sister works at a paint shop and they have specials on certain colors from time to time but it was a pain to make window displays, they did this so now they have three magnets up at all times, on sale, soon to be on sale, and most popular. Absolutely adorable and what a great idea!! ! What a fun idea for magnets!! Thanks for telling us how you did it! I have my polaroid frame resized to 1" x .8" but it is HUGE. If I move them over to an 8.5" x 11" canvas I can only fit 2 on a row. What am I missing? Help please, I need to make these for a gift for Monday (nothing like waiting until last minute - HA!). I'm sorry; are you referring to a different project? 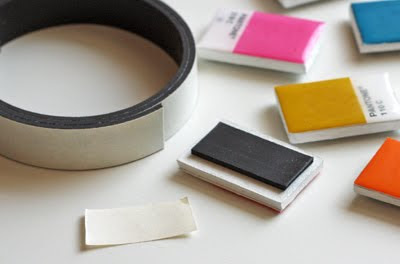 This project uses paper Pantone chips from Pantone books; nothing to do with Polaroids. I'm afraid I'm not following. This is great. I wanted to make a scrapbook page with scrabble tiles, si I am going to make fake ones with this concept. Thanks a mill!! I really wish I would have found this sooner...I just got a new job at a design firm and this would have been a perfect gift to make for everybody...but I guess I know what I'm doing next year. This is a fabulous idea, by the way! so genius! I am sharing your link with my readers tonight as part of a housewarming party ideas! oh i just love these -love the glossy finish! I believe that this person copied your entire post word for word and pasted it onto their blog??? Yup, thanks for letting me know. I've contacted them. These really are beautiful! I have a question, though. Why leave the label on at the bottom? Why not cut that off and just have the color? Is that bad? I think it would look better without it but I figured you probably have a reason for keeping it on there. Just curious. Great project! So it's fun (for me) to keep it on there since it's sort of a graphic design inside joke. But you certainly could cut it off if you like! Or use any other kind of paint swatch. The chips are 3/4" wide by 1 3/16" tall. The colored area is 3/4" square. Mine came out good at first. THEN, they curled up on the edges like they dried out. Had to ditch them...that was a ton of glue!! Wow didn't know about the glaze! It makes them look so legit. Will try! I love the bright colors you used. Can you imagine actually having a wall painted in that bright of pink? ha, that would sure wake you up in the morning! Having been obsessed with these, I have a couple suggestions. I am making mine larger. I am printing the chips from screenshots of the actual chips on Pantone website (not sure how cool that is, but I am not selling these). 1) They make awesome office gifts for marketing people. 2) Someone here suggested Triple Thick gkaze. Costs a lot less and dries 3 times as fast. Looks the same. Magnet sheets I found that hold paper are 20 mil thick stick on. They do not separate. 3) To glue paper to board (I use old mat board) use extra strength glue stick. Super thin coating. Also, I would not suggest cutting anything thicker than a thick paper with an exacto knife. I have too many battle scars. Use a utility knife for the board. Change blades often! Thanks so much Jess! The gift that keeps on giving….